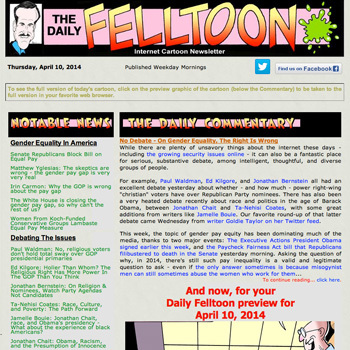 As a weekday publication, "The Daily Felltoon" was an e-mail newsletter, delivered to subscribers, and archived online as an HTML page after delivery. It was published from January 2009 until May 2014. 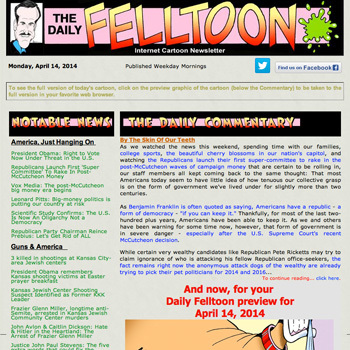 "The Daily Felltoon" combined the award-winning cartoons of nationally known & internationally syndicated political cartoonist Paul Fell, with "The Daily Commentary" of journalist Shawn "Smith" Peirce. Composed with assistance from professional language translator & editor Amy Menge, the newsletter included links to news stories collected from the best news and informed commentary sources online. 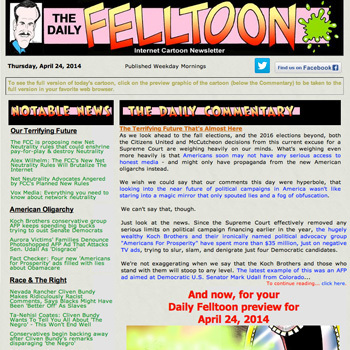 Each weekday, Shawn would aggregate and group these links into logical sections, then lay them out into the template he designed, and publish them as part of the complete version of "The Daily Felltoon." Click on any of the three snapshot images shown here to take a look at that day's full, complete version of "The Daily Felltoon" below.